Delivering safe and secure systems in an increasingly complex and connected world is a daunting challenge. Apache Technologies is the company that removes the risk from next-generation programs with commercial-grade run-time platforms based on industry standards for commercial and defense sectors. Apache Technologies has the products and experience to enable R&D customers to meet deadlines and deliver differentiated products that comply with the most stringent safety and security requirements in the industry. We provide outstanding product development services with expertise in electronics, software and user interfaces for demanding embedded systems. The company continues to expand its business with clients ranging from small technology companies to global corporations. We have developed user interface range from "no user interface" at all — dedicated only to one task — to "complex graphical user interfaces" that resemble modern computer desktop operating systems. Simple embedded devices use buttons, LEDs, graphic or character LCDs (for example popular HD44780 LCD) with a simple menu system. A more sophisticated devices use graphical screen with touch sensing or screen-edge buttons provide flexibility while minimizing space used: the meaning of the buttons can change with the screen, and selection involves the natural behavior of pointing at what's desired. Handheld systems often have a screen with a "joystick button" for a pointing device. Developed user interface remotely with the help of a serial (e.g. RS-232, USB, I²C, etc.) or network (e.g. Ethernet) connection. Like combination of an embedded web server running on an embedded device (such as an IP camera or a network routers. The user interface is displayed in a web browser on a PC connected to the device. We worked on microprocessors(μP) and microcontrollers (μC) both, which have many more peripherals on chip. We have fairly good insight of CPU architectures like Von Neumann, Harvard architectures, RISC as well as non-RISC and VLIW; word lengths vary from 4-bit to 64-bits and beyond (mainly in DSP processors). Some of the processors we worked are Analog DSP, microChip, motorola & various arm based processors. 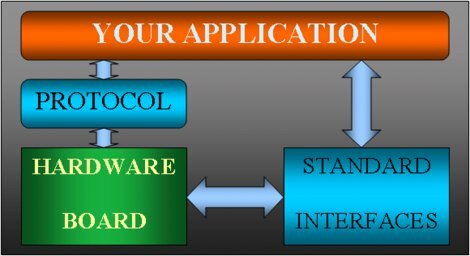 We are familar with various OS like DOS, Linux, NetBSD and embedded real-time operating system such as MicroC/OS-II, QNX or VxWorks. We have developed various multimedia & SDR solution using field-programmable gate array (FPGA). We have complete insight of various peripherals using in embedded/real-time systems. Debugging: JTAG, ISP, ICSP, BDM Port, BITP, and DP9 ports. We are well verse in using compilers, assemblers, and debuggers to develop embedded system software. We also have used some more specific tools: In circuit debuggers or emulators. Utilities to add a checksum or CRC to a program, so the embedded system can check if the program is valid.